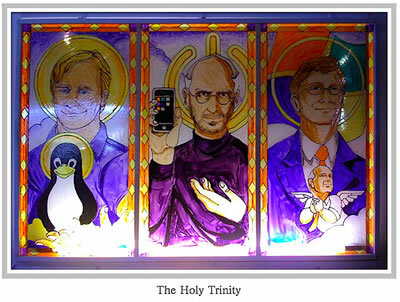 No Western church is complete without a stained glass representation of its major saints. Apparently, there are some modern day worshippers at the Cult of Geek Notoriety who agree. Behold, Saint Linus, Saint Steve and Saint Bill. Be sure to note the BalmerCherub serving Bill Gates.